In 2008, the killings begin again, and Angelica is called in to work the case alongside her old partner’s nephew, who likes Angelica as much as she likes garlic. 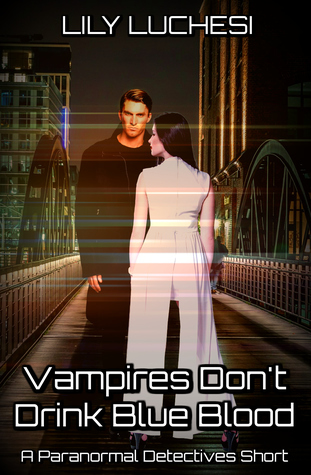 Vampires Don’t Drink Blue Blood is a tasty bite sized prequel to Lily’s Paranormal Detective Series. In this short story Angelica must deal with a revenge seeking Werewolf while trying to keep a civilian Detective safe and in the dark about the paranormal perp. I really enjoyed the story and getting to live more of Angelica’s life before the events in Stake-Out. I read this prequel after already reading the first five books, so some of the now deceased characters were a blast from the past. Hell, Angelica is still a Vamplet (half-human/half-vampire) and able to be out during the day. Even though I am really excited to see how/where the last two books of the series go after the world altering ending of Last Rites, I actually loved being with pre-Danny Angelica in all her sassy, snarky Vamplet glory. After the story Lily has included some Poetry based in/on the P.D.S world. There are characters files and an excerpt from the first book Stake-Out. Vampires Don’t Drink Blue Blood is a fantastic intro into the series, a great way to meet Angelica for P.D.S. novices and a must read for fans of the series. This entry was posted in Book Reviews: ALL by Sarah "SacaKat" Fairbairn. Bookmark the permalink.